A fascinating dual biography of tennis greats Martina Navratilova and Chris Evert celebrates the power of equality, respect, and sportsmanship. Phil Bildner has written many historical picture books, including Marvelous Cornelius and The Unforgettable Season. He lives with his husband in Newburgh, New York. Brett Helquist has illustrated many books for children, including the Series of Unfortunate Events books. He lives in Brooklyn, New York. This spirited, engrossing story, containing an inspiring message and enough information for the fact- hungry, is a fantastic addition to all sports collections, particularly ones needing more titles featuring women in sports. The lively prose and Helquist's action-packed, in-your-face acrylic-and-oil illustrations yield a work as engaging as an actual Evert-Navratilova match. The dramatic cover and well-designed pages will draw readers in and make them feel they have courtside seats. A fine sports story. Nonfiction tennis books for kids are in general in short supply, and so are retellings of powerful true rivalries between star players of any sport. 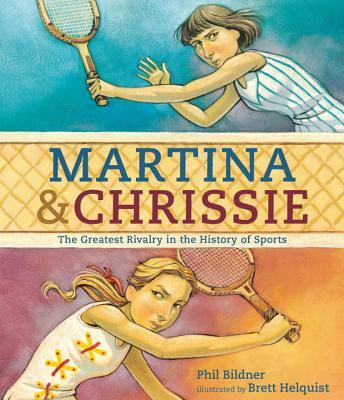 Bildner offers kids both in this picture book biography of Martina Navratilova and Chris “Chrissie” Evert...Though Evert and Navratilova are long retired and largely unknown to most kids, their tale imparts a timely moral: friendship and kindness are what matter most. Bildner (Marvelous Cornelius) and Helquist (The Doll People’s Christmas) offer a gripping dual biography of Martina Navratilova and Chris Evert, two athletes who could not be more different, despite their shared talent...just as important as their competition was the unexpected bond the two women formed off the court: Bildner holds Evert and Navratilova up as an example of how friendship need not always play by the rules. The book captures the importance of a friendship that prevailed between athletes even during their heated rivalry. And isn’t that the beauty of sports?